See humpback whales, dolphins, and more on a 12-hour tour from San Jose. In addition to all-inclusive air-conditioned transportation, your nature excursion conveniently includes both breakfast and lunch, plus snacks to keep you happy and comfortable the whole day. Take a stroll around Ballena Marine National Park, then have your camera read for a boat tour where you get a closer look at Costa Rica's fantastic sea creatures. A walk along the Cola de Ballena formed on the beach of the National Park. 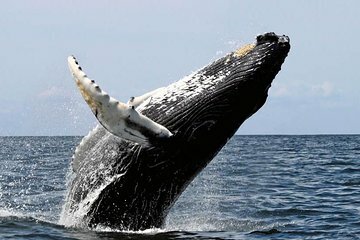 A Boat Tour so you can observe whales, dolphins and many more species.